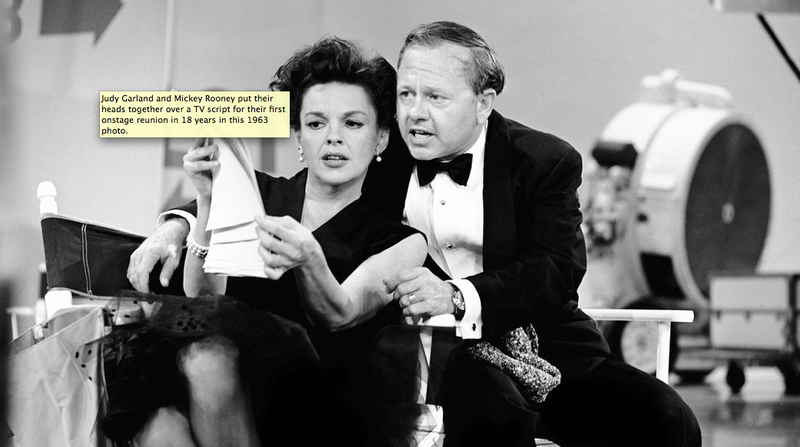 Judy Garland and Mickey Rooney put their heads together over a TV script for their first onstage reunion in 18 years in this 1963 photo. A true Hollywood Legend has passed away at the age of 93 on April 6, 2014. From the age of 6, Mickey Rooney has been entertaining audiences since Hollywood’s Golden Age. He will truly be missed. Even as recent as “Night at the Museum,” he has maintained a presence on the silver screen and your living room television. He starred in more than 200 films over the course of his career and received 2 Golden Globes, 1 Emmy Award, and 1 Academy Award. He was also honored with an Oscar as an adult. He received numerous nominations in many award categories over the course of his dynamic career. He truly represents the best of Hollywood talent. For the Disney fans and Cast Members out there, interestingly, Rooney claimed that, during his Mickey McGuire days, the series in which he first gained national attention, he met cartoonist Walter Elias Disney at the Warner Brothers studio, and that Disney was inspired to name Mickey Mouse after him; although Disney always said that he had changed the name from “Mortimer Mouse” to “Mickey Mouse” on the suggestion of his wife. Rooney was among the last survivors of Hollywood’s studio era, which his career predated. Rooney signed a contract with MGM in 1934 and landed his first big role as Clark Gable as a boy in “Manhattan Melodrama.” A loanout to Warner Bros., brought him praise as an exuberant Puck in Max Reinhardt’s 1935 production of “A Midsummer Night’s Dream,” which also featured James Cagney and a young Olivia de Havilland (last still-living member of the principle cast of “Gone with the Wind”). Unlike contemporary Hollywood, the Studio System (abandoned in the 1950s/60s) developed stars in such a way that is unmatched by present day practices. It was a time in Hollywood in which they employed and contracted regular actors, crew, and other creative personnel to develop movies and shows. He was blessed in such a way that he made regular appearances that built his career to stardom. One could argue that a return to a modern-day studio system would provide more job opportunities for developing talent in the world of entertainment. Not as well known to modern society and entertainment connoisseurs, is that Mr. Rooney enlisted in WWII to entertain American and European the troops during and after the war. He received a Bronze Star Medal for his efforts and dedication to providing quality entertainment during a time in which there were many reasons to be depressed. He was able to bring about smiles and laughter upon the troops. Even during the war, he lived up to his reputation of “putting on a show!” Along side his Bronze Star Medal, we was honored with many other awards from the military. In 2000, Mr. Rooney spoke at the Pentagon honoring the USO. Much in the same way Bob Hope brought smiles to the US military, Mr. Rooney did the same. His commitment to the US military will be a timeless memory cherished by those who benefitted from his talent. Taking after Henry VII, Mr. Rooney also had several wives–8 in fact! In a sense, this provided a bottomless pit of material for comedians who would often craft jokes around his inability to stay married. Mr. Rooney’s first marriage was to then-future Hollywood starlet Ava Gardner, but fell apart before she become the star is is widely known as. Although he is widely known for his multiple marriages, during the later part of his life, Mr. Rooney became a born-again Christian and operated a ministry in California. Following his conversion to Christianity, his marriage to his most recent wife Jan Chamberlin lasted until his death. Read the NPR.org coverage of the story by clicking the link.